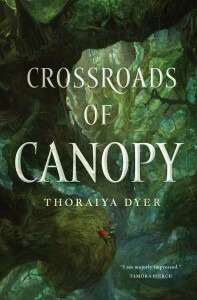 In the second of our interview series, Cat Sparks talks to Thoraiya Dyer, author of Crossroads of Canopy, the ‘highly-anticipated fantasy debut from [an] Aurealis and Ditmar Award-winning author…set in a giant mythical rainforest controlled by living gods’. So I’ll start with a relatively straightforward question regarding your writing process. Or processes, perhaps. Are you a plotter or a pantser? Or do neither of those well-used terms do justice to the way(s) in which you write? I was a proud pantser, before I discovered the horror that is the Series Proposal, hahaha. I usually spend a lot of time gathering bits of worldbuilding – science facts, dialogue, phrases, diagrams, odd place names, all jotted on stickynotes – for arranging in an A4 notebook of some kind. Then I’ll try and force it all into some kind of plot before I start drafting. A separate writing computer with no internet access is at once a luxury and a necessary productivity tool. I work best while the Small One is at school, when the house is as close at it gets to silence, often running over or under my target word count. Also often changing the ending. The more I think about this, the more I start to realise my plotting efforts may have all been in vain. Did you encounter much difficulty moving from short stories to novels? Or were you a novelist all along, dabbling in other forms to hone your craft? Have you encountered specific difficulties doing both at the same time? Well, what I said about missing my target word count a lot of the time is probably relevant. If you fill a novel-length word count with the succinctness of a short story, there will be too many things in it. If you take a chunk out of a novel and call it a short story, there will likely be not enough in it, or it won’t have good resonance because either its beginning or ending will be missing. I think it is difficult to do both at the same time. These days I only write short stories in between novel drafts, and admire folk who split their daily words between more than one project! You often describe yourself as a lapsed veterinarian – how much has your former career influenced your fiction? So much. The science grounding of a veterinary degree has been so useful to me in writing science fiction, and all those clients I saw gave me a pretty complete picture of society and its many iterations. Not everybody feeds their Siamese smoked salmon and spring water (that cat was severely malnourished by the way, do not do this!) and not everybody has to buy giant bags of dog food in bulk to split with their neighbour (in order to save the two dollars that are actually a big deal to their family). Most people are in between those two extremes. But even highly allergic people can’t resist a bald cat or a budgie. Do you have a sense of current world events impacting on your worldbuilding, either consciously or subconsciously? Are there any advantages to being an Australian published in the US? What about pitfalls? Are there things you wish you better understood before signing on the dotted line? I think the main advantage is in the writing itself. We have a unique perspective. Sometimes this will lead to confusion but other times it’ll have advantageous novelty. On the other hand, right now, Crossroads of Canopy is sitting merrily on bookshop shelves in the USA…where I can’t see! I can’t be there in person to promote it, which is sad. But it’s hopefully reaching more people than it could if it was only here. My agent was pretty awesome at explaining the lengthy contract to me, so I have no regrets about the dotted line. Paying tax in two countries is a headache, however! Whose genius idea was it for our financial year to be different to theirs? 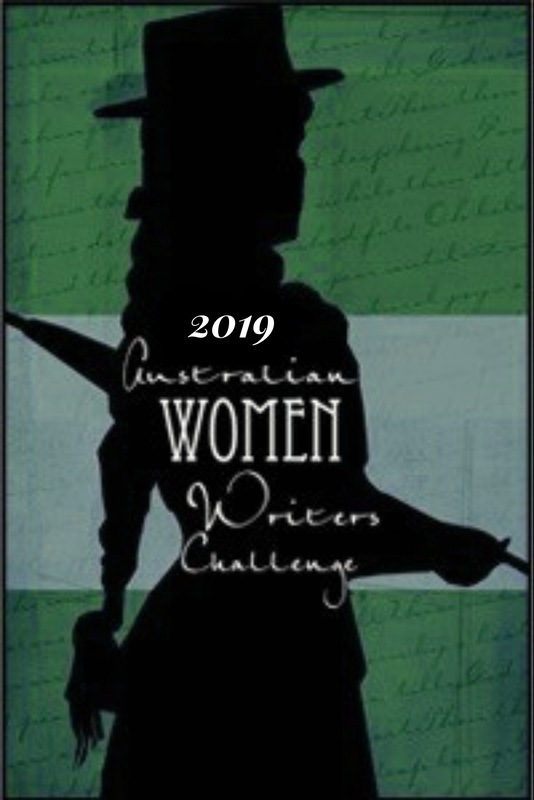 Do you feel much connection with the Australian spec fic writing community? So much connection! Our magazines and small presses are amazing, our podcasters are second to none and our smaller conventions are such a great opportunity to meet others who love the same things that we love. And did I mention how inspiring and morale-boosting the AWW has been? Every time someone looked at Edward Teach or Asymmetry, I felt that little zing that helped me to keep powering on! 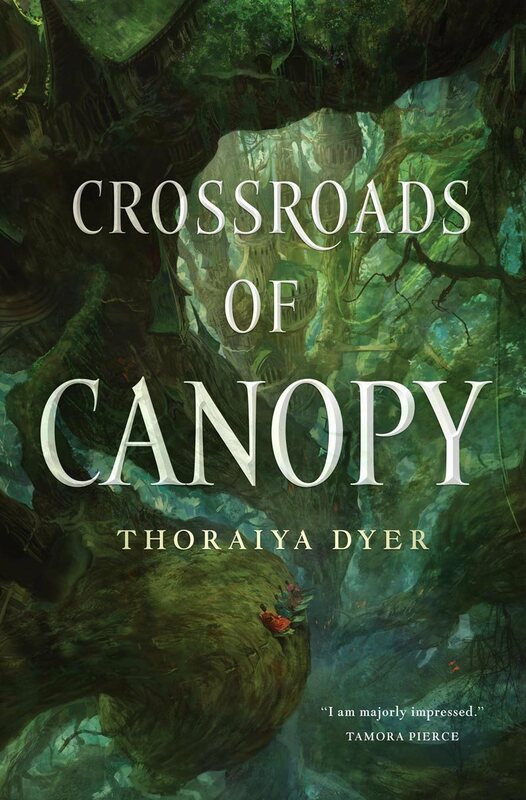 You must be absolutely thrilled to have scored such amazing cover art for Crossroads of Canopy. Did you have any input into the artwork? Sure. I was asked to send photos or choose between things more than once. But all the credit belongs with the artist. I was blown away with the end result. Did you know Marc Simonetti is Hugo-eligible this year on account of this tree-ish cover of Mark Sullivan’s Age of Myth? What is the toughest thing about being a full-time writer? Bad posture. Writer’s Bum. Worrying about money. But life isn’t really that tough for me, in the grand scheme of things. Need you ask, Cat? The destruction of the natural world! But like I said at Tor.com, at least imaginary trees can’t be cut down. Long live the Titan’s Forest! About Cat: A graduate of the inaugural Clarion South Writers’ Workshop, Cat has edited five anthologies of speculative fiction and sixty-five of her short stories have been published since the turn of the millennium. 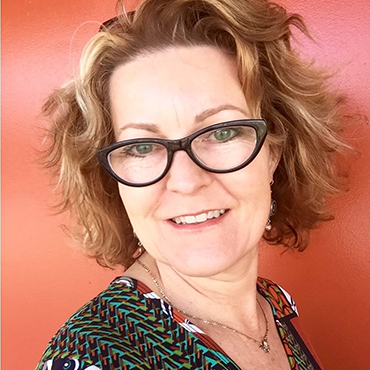 She has received a total of nineteen Aurealis and Ditmar awards for writing, editing and art including the Peter McNamara Conveners Award 2004, for services to Australia’s speculative fiction industry. 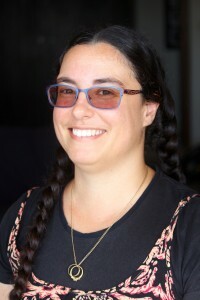 She was the convenor of the Aurealis Awards horror division in 2006, a judge in the anthologies and collected work category in 2009 and the short SF division in 2013. Her novel, Lotus Blue will be published by Talos Press this month.